Convert from SDI to HDMI so you can output video from professional SDI video equipment to consumer HDMI televisions, projectors and more. The multi rate 3G-SDI automatically switches between all SD and HD formats up to 1080p60. You also get 3G-SDI loop through, support for Level A and Level B equipment, and power over USB. 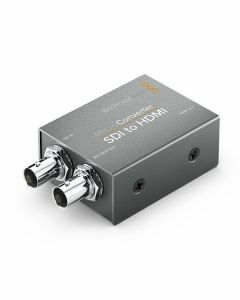 The Blackmagic Design SDI to HDMI Micro Converter converts from SDI to HDMI, enabling the user to output video from professional SDI video equipment to consumer HDMI televisions, projectors and more. The multi rate 3G-SDI automatically switches between all SD and HD formats up to 1080p60. 3G-SDI loop through, support for Level A and Level B equipment, and power over USB are also provided.